Whole30 compliant Peach + Jalapeño Chicken Wings from the Whole Smiths. The perfect appetizer for any gathering. Particularly during football season! I mean, I’m pretty sure wings and football have met before, right? They’re old buddies as far as I know. However, have Whole30 compliant wings met the best season of sports around? Maybe. But not like this. I am fully obsessed, I don’t even know where to start. With the wings? With football? How about the fact that the kids have finally gone back to school and I feel like I forgot how to use my brain all summer and am not sure what to do with it now? Let’s start with football. The kids are back at school which means football season is here. It means fall and pumpkin and Sunday Funday is back in season. I had my Fantasy Football draft earlier this week (don’t let me down Bell & Rodgers! ), I’m already inviting friends over gamedays, planning my menus. And I’m reeeeeeally hoping the 49ers can do better than last season. AND! Even more exciting? This year I’m a member of the NFL Fan Style Lifestyle Council. What that means is I’m going to be sharing the best of gameday food, gear, and pretty much everything cool and football related all season long. I’ll make sure to be linking to my favorite NFL products throughout the process, because gameday gear has gotten super cool these days. It’s not just about a jersey and a foam finger anymore. 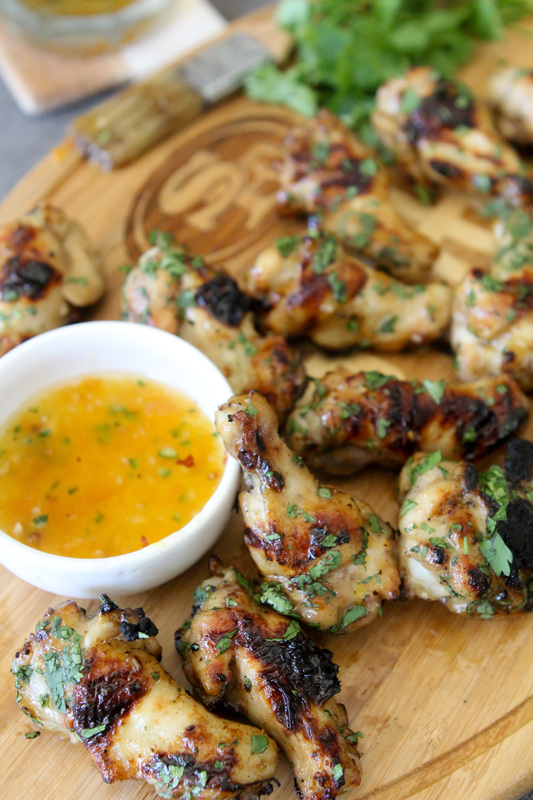 Here’s my first tease at getting you excited for all things football and fall… Peach + Jalapeño Chicken Wings. On the grill. All charred and smokey. Perfect for your gameday. AND they’re Whole30 compliant. Guys, trust me when I say eating well and having fun are not mutually exclusive. When I first decided to clean up my diet, I really thought that meant no more fun. I attached fun to food and drinking. And if I’m getting specific, junky food and junky drinking. The truth of that matter is I still attach fun to both but know how to do it in a way that’s still healthy and sustainable for me. 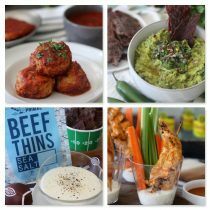 And all season long I’ll be showing you fun and tasty homegating recipes that are just that. I’ve also come to realize that part of the fun for me in the entire process. Football has become a way for our family and or friends to be together every Sunday. And Monday night. And Thursday nights. And even sometimes now Saturday nights. And Thanksgiving. Ha. I love getting our gear together (including the girls’) and getting ready for a day of food, smack talking and tackles. And I love how cool football gear has become these days. It’s not just about jerseys and those 90’s Starter jackets/parkas that every guy you’ve ever known once owned. Your husband may even have his stashed in a box in your garage still. 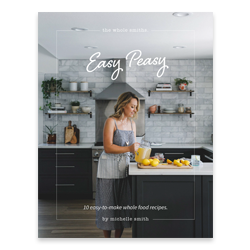 There’s some amazing swag available now, particularly for women and us foodies and I’m excited to share all of it alongside some tasty recipes all season long. 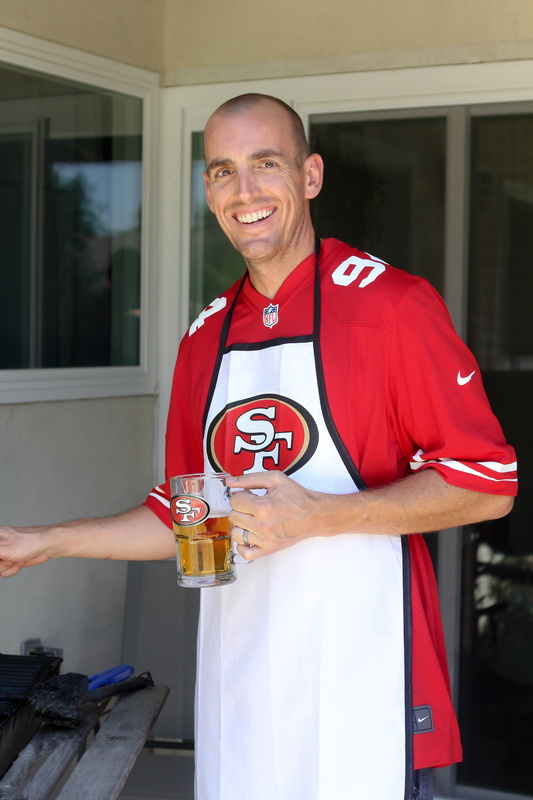 You know what I’ll digging most about this 49ers apron? That if any Seahawks fans find their way to our house during the season, they aren’t going to dare talk smack to the cook, right? No respect, no food. I can also serve them their beer in our 49ers pint glasses in the hopes they know better. Although, truth be told, I don’t have much of a leg to stand on after the Niners last season. But I figure I can keep the trash talking at bay with bomb food and an apron to remind them who’s boss. Here’s hoping it works. Please don’t tell them my secret. If any of you Falcons fans have Patriots fans over I suggest you employ the same strategy. You can find your own teams HERE. A couple of notes on this recipe. If you are looking to make it sure it remains Whole30 compliant, you must use fruit preserves without any sugar added. It’s got to be straight up fruit preserves. If you can’t find no sugar added peach preserves at your local supermarket, have no fear as there are lots of other flavors that you can try. A quick list includes apricot, mango, and cherry. Have fun with it. But please, no sugar. You know the rules. As well, there is just a slight kick to these because in our house, #kids. Personally I like spice, but I’m far too lazy to make separate batches so I often keep things on the mild side. But that doesn’t mean you have to. For more of a kick, up those jalapeños and you’ll be good to go. Got it? Good. With that being said, “Are you ready for some footbaaaaaall?”. Sorry, I had to add that in. 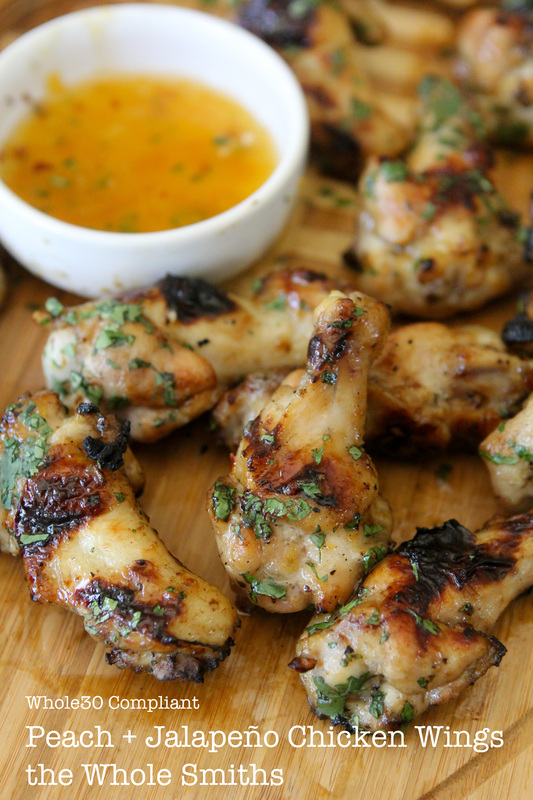 Peach + Jalapeño Chicken Wings from the Whole Smiths. 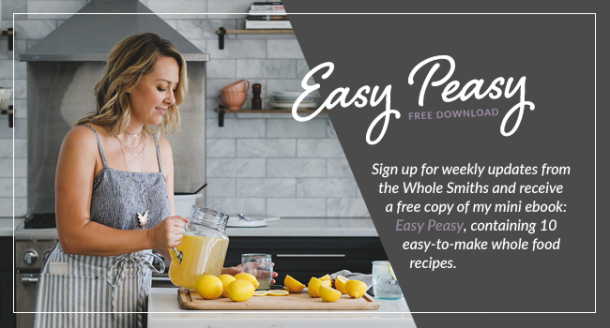 Whole30 compliant and so easy to make! 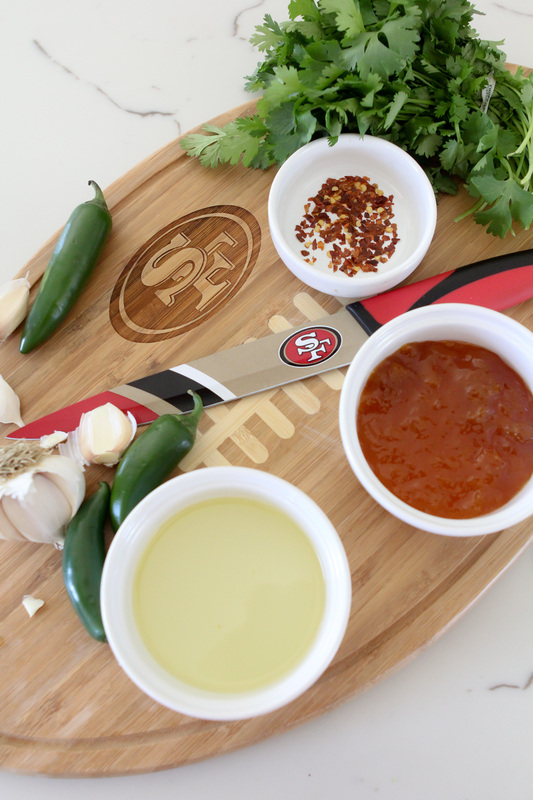 A crowd pleaser for sure, perfect for parties or tailgating. MUST-make! 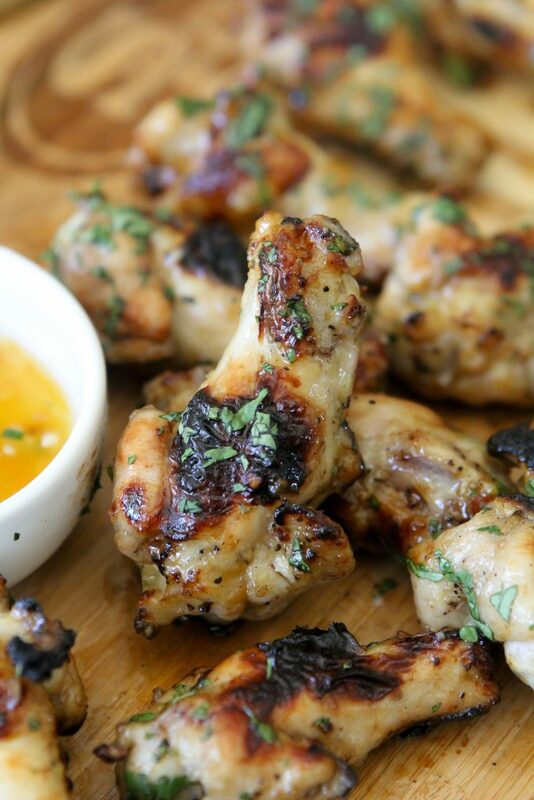 Season the chicken wings liberally with 2 teaspoons of the salt and the black pepper. Let the chicken wings rest for 30 minutes. 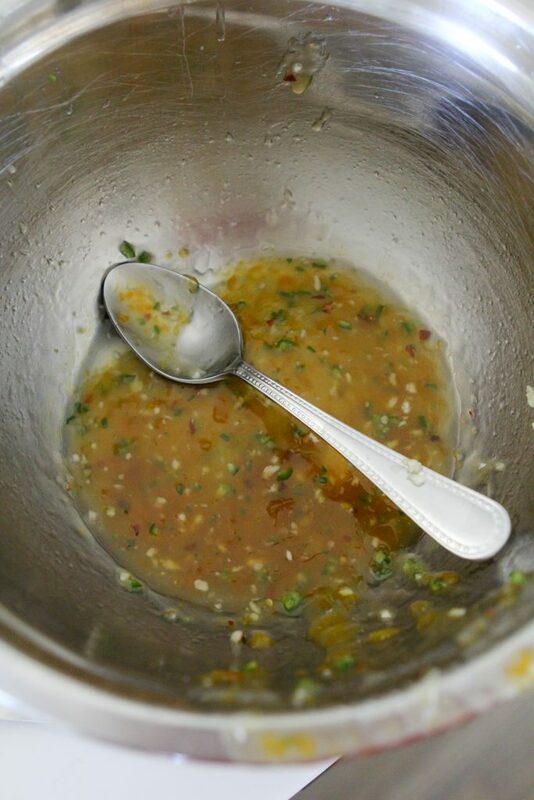 In a large bowl combine the peach preserves, olive oil, garlic, jalapeño, red pepper flakes and remaining teaspoon of salt and stir to combine well. Remove 1/3 of the peach sauce from the batch and set it aside. Add the seasoned wings to the remaining peach marinade and toss to coat well. Fire up your grill and when it's ready place the wings directly over the heat and cook them for 15 minutes, flipping them every 3-5 minutes. Make sure they aren't burning! If they are getting to charred, move them a bit away from the heat. 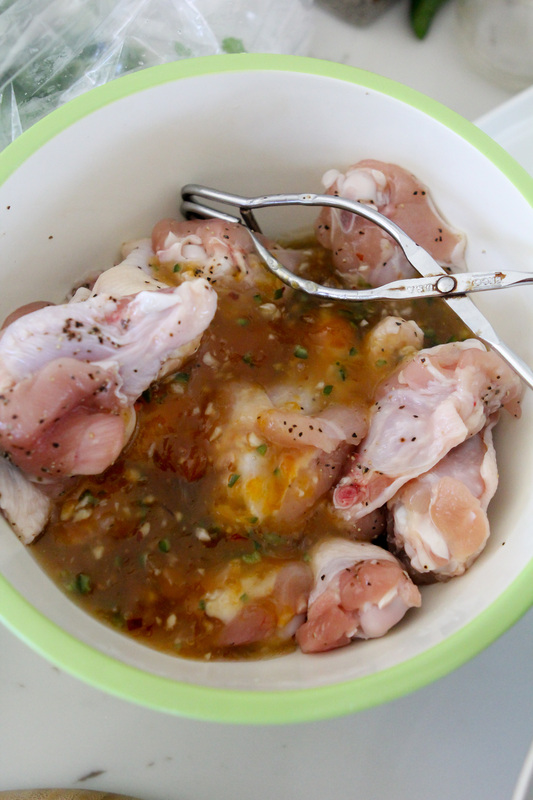 Brush the remaining peach sauce over the wings, flip and cook for an additional minute and remove them from the grill. Sprinkle the cilantro over top to serve. How much peach preserves? It says “½ + 2 tablespoons cup”. Is that 1/2 cup + 2 tablespoons? Yes, 1/2 cup and 2 tablespoons. I’ll fix that! 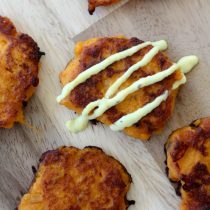 Reallllly want to make these but don’t have a grill (live in an apt in Chicago)…could these be baked?? 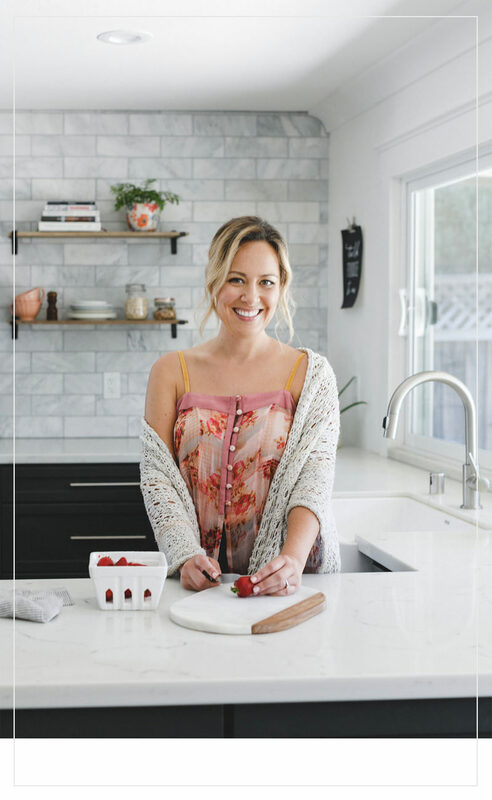 Where did you find sugar free preserves? Whole Foods was a bust for me. 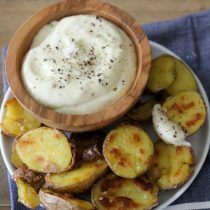 Do you by chance have the nutrition facts for this recipe? Hi there! 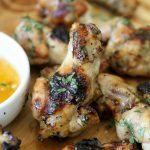 I am dying to try this recipe because I absolutely love the combination of sweet and spicy. However, I can’t find no sugar added peach preserves anywhere! What brand do you use, and what grocery store do you buy them from? Thanks!